A new survey reveals that not only do business executives value college, they want students with skills associated with the liberal arts. Though public support for higher education seems to be waning, this skepticism doesn’t appear to extend to potential employers, who say they still have faith in colleges and universities, according to a new survey conducted on behalf of the Association of American Colleges & Universities. But while executives and hiring managers believe that institutions are teaching graduates the skills needed for entry-level jobs, they reported that students usually aren’t ready to be promoted. AAC&U commissioned the Washington, D.C.-based Hart Research Associates to survey two groups: 500 or so business executives in the private sector, and 500 managers whose duties include recruiting and hiring new employees. The opinions of the executives and the managers did not differ much — in fact, 63 percent of both groups expressed “a great deal” or “quite a lot” of confidence in colleges and universities. Compare this to Gallup research from last year that showed only 44 percent of the random sample it polled had confidence in colleges and universities. The divide deepens along partisan lines, with only 33 percent of Republicans expressing confidence; 56 percent of Democrats reported confidence in higher ed. The association titled the report “Fulfilling the American Dream: Liberal Education and the Future of Work,” because it was mindful of the worries the public has about higher education, said AAC&U president Lynn Pasquerella. While they are generally confident in higher education, business leaders’ faith does diminish around the skills that students are learning in college. While a majority of employers (57 percent of executives, 60 percent of managers) believe that students have the knowledge to succeed in entry-level positions, few of them think graduates can advance in a workplace — only 34 percent of executives and 25 percent of managers believe students have the skills to be promoted. “When we talk about the liberal education, it’s often in terms of lifelong learning and preparing students not only for their first job, but for their last job,” Pasquerella said. 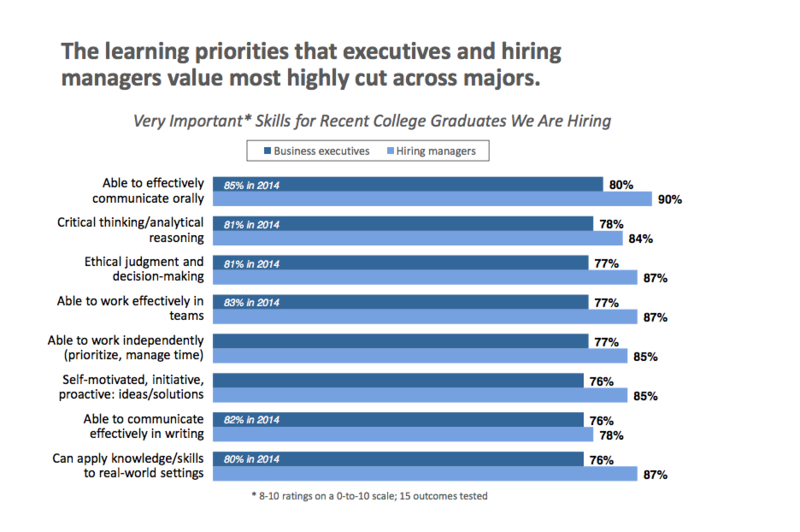 Also notable in the findings: business leaders appear to value more generalized skills, ones that aren’t specific to certain majors. The general public has soured on the concept of a liberal arts education, which AAC&U has expressed concerns about in the past. A couple of the skills that both parties valued the most: effective oral communication and critical thinking. But while 90 percent of managers, and 80 percent of executives, considered oral communication “very important” in their hiring, only 47 percent of the managers and 40 percent of the executives believe students are well prepared in this regard. Those surveyed indicated they’d be much more likely to hire a student with an internship or an apprenticeship — often where students learn some of these generalized skills. Pasquerella also said institutions should be mindful of the continued and growing economic segregation in higher education, and ensure that underserved students are being reached with these types of opportunities. “It underscores the importance of providing the opportunity to engage in high-impact practices and real-world experiences,” she said.